One way to think about Iowa is it is one small spot on a very large spaceship hurtling around the sun. Though big, the earth is finite, and so are its tremendous resources. Only a foolish astronaut would deliberately contaminate limited supplies. That’s the attitude we at VanWeelden Company take when recycling shingles. 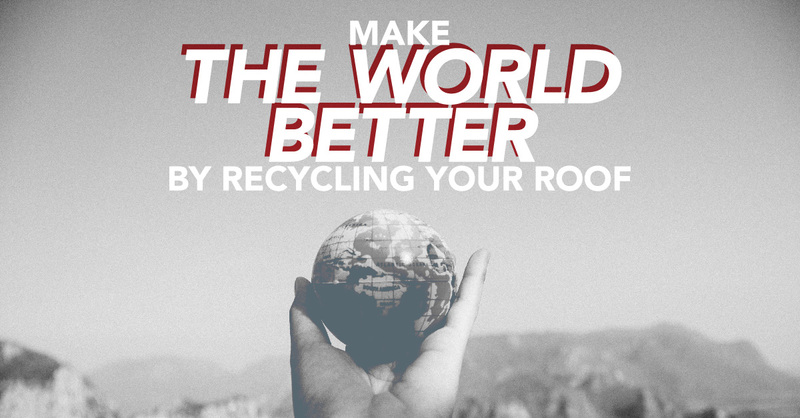 We want to make the world better by encouraging all our customers to recycle their roofs. VanWeelden Company is extremely proud to have earned our designation of Owens Corning Platinum Preferred Contractor. Owens Corning is one of the largest shingle manufacturers in the world. The company oversees a vast network of conscientious roofing contractors committed to recycling residential roofing shingles. Shingles are made in large part from asphalt, the same compound roads are paved with. Because of this, shingles can be reclaimed, shredded, and turned into fresh asphalt for paving. With shingles being the most recycled products in the United States, Owens Corning steps forward as an industry leader to encourage roofing contractors to recycle old roofs. Des Moines Metro Waste Authority accepts roofing shingles for recycling at both the Metro Park East and West landfills. Diverted from entering the landfill, the shingles enter the landfill site at a reduced rate and are sent on to recycling companies capable of converting your old roof into new highways. The roofing manufacturer is on board. The municipal waste manager is on board. The last part of the process is finding a local, reliable, environmentally conscious roofer, and VanWeelden Company is that roofer. We are proud to have diverted 1.5 million pounds of shingles from the Des Moines landfills to recycling plants, doing our part to keep Iowa lush, green, and clean. To do this level of recycling takes no small commitment. Our crews know to send out “clean” loads only: nails and underlayment are okay. However, no shingle recycling batch can include wood, plastic, vinyl, mastic, or other contaminants. That level of pre-sorting is not easy, but we do think it is worthwhile. We hope you agree and will consider shingle recycling for your next roof. VanWeelden Company supports a clean Iowa. We can help you do your part to keep our environment pristine and beautiful. Contact our offices today to see how we can install a new roof on your Des Moines home and keep your old shingles out of landfills.